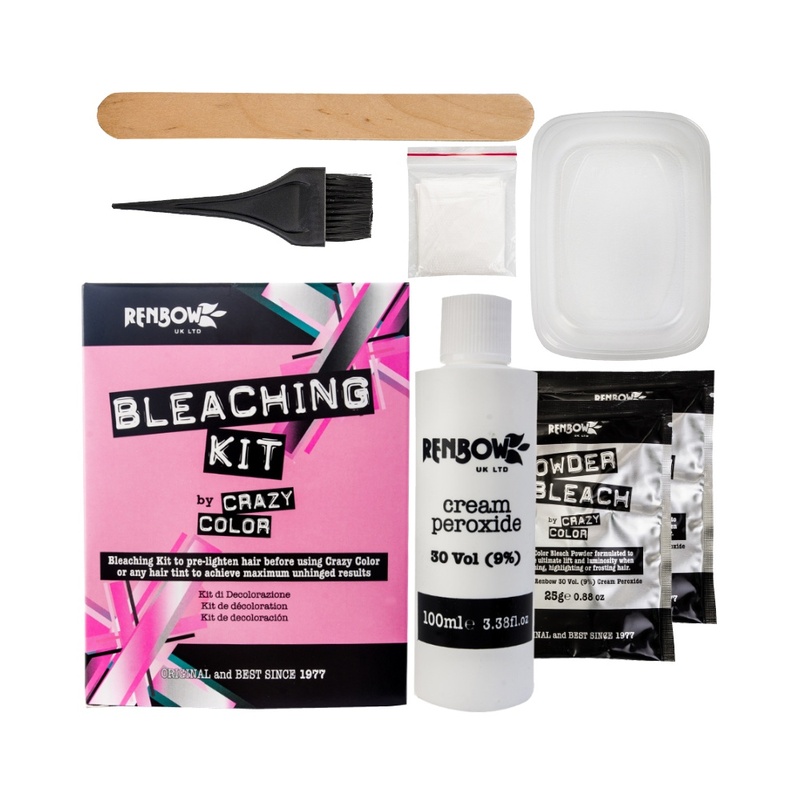 Renbow bleaching kit is your complete tool box for pre-lightening and bleaching the hair safely and professionally. This is ideal for use before applying any Crazy Color hair dye to your hair to achieve optimum colouring results. We always reccomend consulting a professional hairdresser before using any bleaching products at home. This pack contains: 100ml cream peroxide (9%) 30vol, 2 x sachets of 25g bleaching powder, a pair of disposable latex gloves, a tinting brush & mixing bowl and a spatula along with fully descriptive instructions. Keep bleach powder closed until ready to use and store this product in a cool, dry place away from direct sunlight. Always wear plastic or rubber gloves when handling this product to protect the skin. Do not apply peroxide direct to hair. To avoid damage to your hair, it is advised to ensure a break of 14 days between applying this product and previous hair treatments. Your natural hair colour will determine the development time required. Please see enclosed leaflet for details on how long to leave the product on the hair. Crazy Color® was launched in 1977 in the midst of the punk rock explosion and has been loved worldwide ever since. In every iconic pink bottle comes a colour that will rock your world. Vamp it up with Fire or amplify with Peacock Blue. Always keeping up with the latest trends, Crazy Color has recently launched its pastel range which is awash with pretty pastel hues. Never miss a beat with Crazy Color cream hair dyes, live your life in colour!